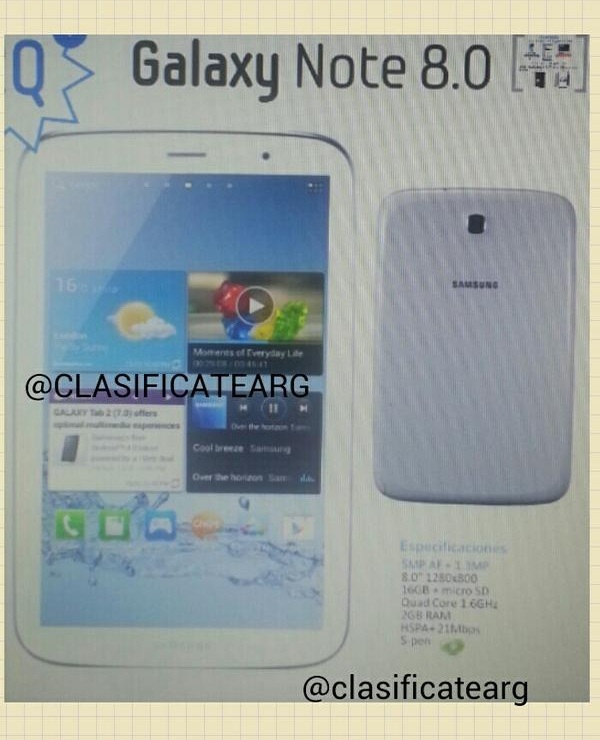 Now that we have already established the existence of Samsung Galaxy Note 8.0 tablet (confirmed by a Samsung exec). And in the wake of the “Samsung Roadmap” leak, it was not long before the images of the tablet would have to emerge. The regarding roadmap suggests that the tablet will be the major release for Samsung in early 2013; lo and behold the images have already started to arrive. At this point we are almost certain that the illusive Galaxy Note 8.0 is indeed in the making and will be releasing, so these images might be the real deal. And it seems that some lucky guys have gotten their hands on the device and are already tinkering with it, and some of those lucky chaps have decided to share the photo with us non-enlightened folks. Remember this might just be an elaborate hoax, as the picture is taken from a relatively unknown twitter account. The leaked image is looking to be a capture of a press image. And judging by the peculiar lines on the photo, we can safely say this is a photo of a photo displayed on a screen. The Galaxy Note 8.0 seems to be following the current design model for Galaxy devices, even more so that it strongly resembles the smartphones. Galaxy Note 8.0 is practically looking like a inflated Galaxy S3, well at least to me. The same plastic back plate can be seen featured on the tablet, which might enrage some fans who were hoping that Samsung dropped this of 2013. Regardless we can only hope that the Galaxy Note 8.0 will be present at Mobile World Conference behind held next month at Barcelona. But given the vigilant nature of today’s snoops and snitches we might get to see a detailed video of the device well before the actual unveiling. Not that we would mind that, might I add.